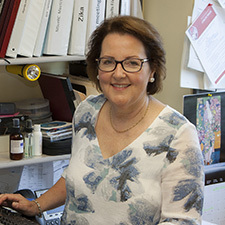 Dr. Kirsten St. George, Chief of the Laboratory of Viral Diseases at Wadsworth Center, was recently invited to speak at a technical workshop hosted by the Trust for Science Technology and Research of Puerto Rico, the Brain Trust for Tropical Diseases Research & Prevention, and the CDC Dengue Branch. The Aedes aegypti mosquito (left) is the primary vector of dengue and Zika virus worldwide. It is not found naturally in New York. Aedes albopictus (right) is capable of transmitting dengue and is found in New York. Dr. St. George visited Puerto Rican laboratories to discuss molecular testing capacity, methods and resources. More than 40 representatives from the main clinical laboratories in Puerto Rico joined scientists from the host organizations at the meeting, which also included staff from the Puerto Rico Public Health Laboratory, Puerto Rico Consortium for Clinical Investigation, Ponce Health Sciences University, and the Association of Public Health Laboratories. The local newspaper characterized the event as “a transformative opportunity for clinical reference laboratories to become developers of new diagnostic technologies.” Dr. St. George described arbovirus surveillance and the processes for designing and implementing laboratory tests. The product of the workshop will be a document, detailing recommendations to improve resources and laboratory testing for viral diseases and to integrate the existing infrastructure for enhanced responsiveness to emerging disease threats. Many of these threats can be traced to the Aedes aegypti mosquito. Zika has captured the limelight of late, but it isn’t the only virus transmitted by Aedes mosquitoes. Nearly half the world’s population is at risk of infection by the closely related dengue virus, and reports indicate incidence is on the rise in recent years: up 42 percent in Vietnam over the same period last year and up 280 percent in India over the last three years. While nearly all cases in the United States are travel related, dengue is endemic in U.S. territories such as the U.S. Virgin Islands and in Puerto Rico where the Center for Disease Control and Prevention’s (CDC) Dengue Branch is located. Additionally, other mosquito transmitted viruses, including yellow fever and Oropouche, are of mounting concern in Central and South America.